LAS VEGAS — Lithia Motors Inc. wants to own dealerships across all U.S. regions and in Canada. Lithia's leaders believe branching out will help it expand its technological innovations and build the scale needed to accommodate ride-hailing and fleet management in the future with the advancement of self-driving vehicles, CEO Bryan DeBoer told Automotive News here at the NADA Show. "We've spent a fair amount of time looking over the border. We've only spent a little time overseas looking at potentials," DeBoer said. "Organizations mature and it makes sense to become international. I do think it's in the cards for our future because it gives us a broader spectrum." Lithia, of Medford, Ore., owns 185 dealerships across 18 states. It has stores on both coasts, the Northwest and the Northeast. DeBoer said it will expand into the Southeast next. "That's more about having a national footprint across the entire country, which we believe could be beneficial a decade or two from now in terms of national branding, the ideas of car-sharing or fractional ownership," DeBoer said. "It can be our next level of adaptation and [finding a new] profit stream." 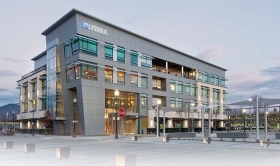 Lithia has been aggressively expanding for years. In 2014, it bought DCH Auto Group, which had 27 stores in New York, New Jersey and Southern California. In late 2016, Lithia entered markets in upstate New York with the purchase of nine stores from Carbone Auto Group. In May, it acquired Pittsburgh's Baierl Auto Group, adding its first dealerships in Pennsylvania. In August, it bought Downtown Los Angeles Auto Group. This year, Lithia has bought six dealerships from Prestige Family of Fine Cars in Bergen County, N.J.; and Day Automotive Group in suburban Pittsburgh. Lithia ranks No. 4 on Automotive News' list of the top 150 dealership groups based in the U.S., with retail sales of 167,146 new vehicles in 2017. The group has been shopping in Canada for two to three years, DeBoer said. In that time, it has built "a number of" relationships there, DeBoer said. But a deal will only happen if it's priced right, is a cultural fit and will clear Lithia's return on investment hurdles, he said. "It wouldn't change our return expectations by moving to something that's more risky, because it is more risky to move international when you're not there," said DeBoer. "We need to find a partner that has enough space to leverage their people and the culture they know about that country, to be able to grow from." 2018: Day Automotive Group, Pittsburgh; Prestige Family of Fine Cars, Bergen County, N.J. In the U.S., Lithia has "about a two-third footprint" of what it wants, De- Boer said, and seeks to fill in the geographical area where it still lacks stores: the Southeast. He wants to buy in larger, metropolitan markets there. "We're hoping that getting into these bigger markets, we'll be able to attract people that understand consumer behaviors, technology and the adapting of that technology to their behaviors," DeBoer said. Lithia owns about 80 per cent of the real estate its stores sit on. As it moves to cover the country, DeBoer said, owning the real estate is a priority. "We'd like to have 100 per cent footprint in the country so that when you move to fractional ownership or greater car-sharing, we would be able to leverage those centralized warehouses for cleanup, reconditioning and possibly storage of vehicles," DeBoer said. But, he added, there's time. He predicts any significant change to the retail model involving ride-hailing or automated vehicles is 10 years away in metropolitan markets and 20 years away in rural markets. Said DeBoer: "The speed of change, we believe, is going to be slower than what has been discussed over the last year or two."